Professor Englezos has over 30 years of research experience on several fundamental and applied aspects of clathrate or gas hydrates. He has published extensively in this area including reviews on clathrate hydrates, kinetics, energy and climate change. He has also developed expertise on several aspects of papermaking chemistry or “wet-end” chemistry. The link connecting these apparently different areas is that the systems under study are aqueous multiphase systems. 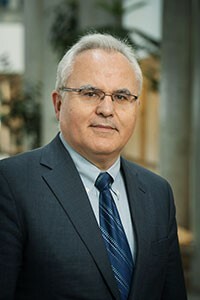 In order to tackle these complex systems his research methodology is based primarily on chemical thermodynamics aided by kinetics, mass transfer, colloid chemistry and optimization methods. The experimental approach involves macroscopic techniques and a suit of molecular level studies. He has co-authored a book on Applied Parameter Estimation for Chemical Engineers.